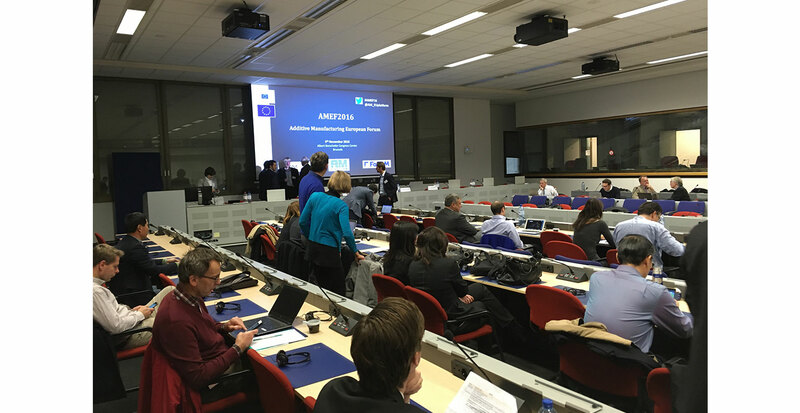 On 9th of November, Albert Borschette Congress Center hosted the Additive Manufacturing European Forum #AMEF2016. The event was born from two strategic Coordinated Support Actions: “AM-Motion: A strategic approach to increasing Europe’s value proposition for Additive Manufacturing technologies and capabilities” and “FoFAM: Industrial and Regional Valorisation of FoF AM projects” and counts with the endorsement of the European AM Platform. Here you can see the LASIMM presentation (http://www.prodintec.es/attachments/article/967/Panel%20discussion%20-EWF-LASIMM%20project.pdf ) and find out what are the expected results, objectives and characteristics. The Additive Manufacturing European Forum 2016 is an event that brings together the European AM community: policy makers, industry leaders, small to medium-sized enterprises, as well as universities, research and technology centres and other key stakeholders to build a European Strategy and a Roadmap on AM. The debate on the economic, social and technical challenges urging to be solved can accelerate the AM market uptake in the digitalisation era.